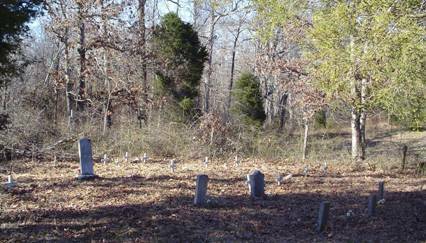 The Roberson Cemetery is located on Whitten School Road off Highway 13 north of Florence, Alabama. Travel north from Florence, Alabama approximately 13 miles and turn left onto Whitten School Road. Go approximately 1.2 miles and the cemetery is on the right at the crest of a hill. The cemetery lies about 15 yards off the road. This is a very small cemetery with only five graves with markers. There are eleven others marked only with white crosses, totaling 16 graves in all. Roberson, M.J.; b. 19 Dec 1852, d. 02 May 1920, wife of H.G.